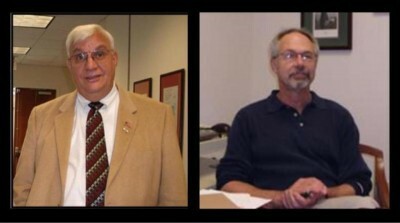 Thank you Mike Ragland (l) and Jack Paltell (r)! On Wednesday, January 7, 2015, the Law Library hosted another successful Ask A Lawyer In The Library program. Thank you, Mike Ragland and Jack Paltell, from Bell, Ragland, Gauges & Paltell, for volunteering and providing this service to the public. Six people took part in the program and were able to speak with the attorney to request assistance with issues such as employment termination, foreclosure, property, wills and trusts. The next program date is Wednesday, January 14, 2015. This entry was posted on January 7, 2015 at 1:37 pm	and is filed under lawlibrary, Pro Bono, Self Represented. Tagged: lawlibrary, lawyer-in-the-library, probono, ProBonoWeek, selfhelp. You can follow any responses to this entry through the RSS 2.0 feed. You can leave a response, or trackback from your own site.